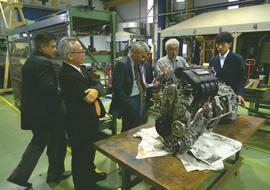 On November 8 (Thu), TUT received a visit from five members of Indonesia's Bandung Polytechnic for Manufacturing (POLMAN Bandung), including the institution's principal. Established in Indonesia by the Swiss government and Indonesia's Bandung Institute of Technology in 1973, POLMAN Bandung was Indonesia's first polytechnic. The institution's philosophy is, through technical engineering production technology education, strive to cultivate human resources who can play an active role in the industry. During this visit, observations were made centered around mechanical engineering at TUT to create a reference for future education at POLMAN Bandung. 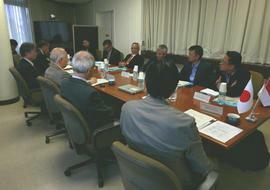 After a lively exchange of ideas with President Onishi, Vice President Terashima, Professor Uchiyama, Professor Hozumi, Professor Daimon, Specially-appointed Professor Koike and Associate Professor Sekishita regarding collaborations between university and industry, the group visited the Center for Human-Robot Symbiosis Research and the Cooperative Research Facility Center. 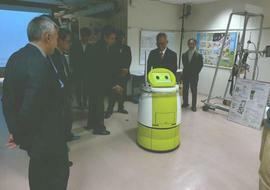 Here, among other things, the group were able to actively inspect the latest research on robots and equipment used at the Cooperative Research Facility Center.